In Japan, there's a scary sight on a port in Isumi City of Chiba Prefecture. 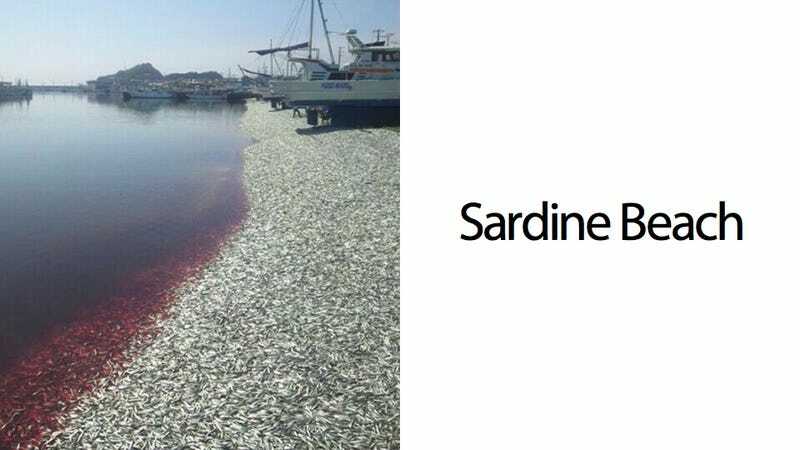 The ground has been covered by 200 tons of dead, rotting sardines and the ocean has been stained red with their blood. It looks like a beach from hell. According to Japan Today, the rotting sardine beach started crashing onto the shore over the weekend and continued into this week. It's insane that there were so many sardines on the ground it looked like rocky sand. The smell from the sardines, as you can imagine, is god awful and cleanup projects have begun to bury the sardines in landfills. The scariest thing is that no one is sure why this is happening, some are saying it's a lack of oxygen, others are pointing to it as an omen for another disaster.